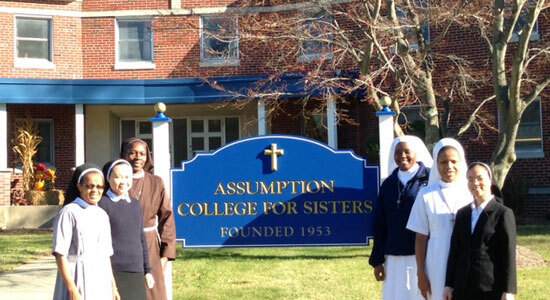 Any woman who has been accepted for membership by a Catholic religious community can apply for admission to Assumption College for Sisters, regardless of race, color, or national origin. Women who are in a serious discernment process, with the recommendation of a vocation or spiritual director, may also apply, though they are not yet part of a formation program. Lay persons may register for theology and philosophy courses and may audit any other courses. The prospective student will submit to the registrar her completed application form, a transcript of all high school work, a college transcript if she has taken college courses, and the immunization records (MMR) required by the State of New Jersey. A student born prior to 1957 is exempt from the immunization requirement. Resident international students follow a more detailed policy for admission. The Superior General or Provincial Superior of the sending community requests a scholarship for a particular Sister of her community, giving some background about the works of the community and reasons for the request. An ACS administrator sends the application and medical forms to be completed and returned with the Sister’s official school transcripts, along with a notarized translation if transcripts are not in English. The College administration carefully reviews the completed forms when they are received. Upon approval, the Sister is officially registered with the Department of Homeland Security’s Student and Exchange Visitor Information System (SEVIS) and the I-20 form is issued for a student visa. The College is given advance notice of the date of arrival at Newark Liberty International Airport. The respective community is responsible for making and paying for travel arrangements, paying expenses incurred for health care, and paying incidental expenses not covered by the Sister’s scholarship. The respective community is responsible for reimbursing ACS for the SEVIS I-901 fee. The respective community assumes the entire responsibility for application to other institutions after graduation from ACS, as well as for arranging for travel and board elsewhere. The Academic Dean evaluates college transcripts to determine which courses may be accepted toward a degree from ACS. To qualify, courses must fulfill the degree requirements of this College and rate a minimum grade of C. A World Educational Services (WES) evaluation is required for transcripts from colleges outside the United States. ACS gives college credit to students who have received a rating of three in an Advanced Placement Test. It also honors high school dual-credit courses when applicable. With the approval of the Academic Dean, anyone interested may audit classes. Half tuition is charged for those who audit a complete course. For more information concerning admission contact Sister Joseph Spring, SCC, at president@acs350.org.